She wakes up every morning and womprats prepare her clothes. She lived with seven Jawas after she was sent away from home. She’s not looking for a prince, but a scoundrel finds her, anyway. She’s really good at keeping her shoes on while running, but she has a tragic backstory just like any good, old fashioned Disney Princess. 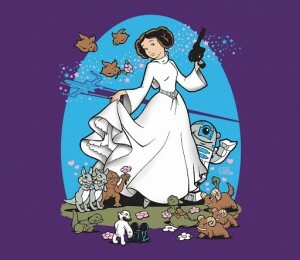 Welcome to the club, Leia. You get to hang out with Ariel and Cinderella and Snow White and all the other princesses. On the other hand, I won’t blame you if you choose not to. You’ve got an army to manage.